Just in case you stumbled upon it , rest assured you are still on the correct URL. Please do give us some feedback on the new design interface after the launch - we are always on the lookout to improve things as technology develops further. This book is designed to assist anyone who has a genuine interest in learning to read, write and speak the Igbo language. It is especially intended to support and encourage all Igbo children growing up in the Diaspora who have a strong desire to connect with their heritage language. Although intended for absolute beginners, it will also be of immense value and interest to Igbo experts at all levels of education. It is fully tone-marked to aid pronunciation. It is also copiously and visually illustrated to aid understanding. The book is structured into two parts, namely: Basic concepts and Essentials of Igbo grammar, with each part adequately complementing the other. The basic concepts range from the Standard Igbo Alphabet to discussions of Colour, Numerals, Our Concepts of Time, Greetings, Situational Dialogues, Kinship terms, Prayers, Songs and Riddles, Household Objects, Animals, Our food, Musical Instruments, Health and Wellbeing and Parts of the body. Essentials of Igbo grammar on the other hand takes a look at the basic grammatical elements that drive communication in the Igbo language, namely: the recognised grammatical categories, the place of Tones in Igbo, Igbo sentence types, and many more. A familiarization with any number of the above concepts would no doubt place the learner in a good stead towards a general understanding and appreciation of the language as a whole. Also in his introduction to The Rise of the Igbo Novel, Ernest Emenyọnụ noted as follows: “... It even seems there is not much enthusiasm any longer among the Igbo people to create literature in their vernacular... It has only fallen into the background because the present-day Igbo (not least, popular Igbo authors) have come to see and accept English not only as the official language of Nigeria, but also as the language of Igbo literature...”5 Well, the sad irony is not just in the dearth of Igbo literature; it is more so in the fact that despite producing some of the best brains and finest writers of African history and literature in English, the Igbo nation has remained largely illiterate as far as reading and writing its own language is concerned. The average Igbo man not only finds reading and writing Igbo a challenging experience but also considers it wholly unnecessary; an attitude often summed up in that arrogant quip: “Èjì m̀ yà èmé gị́nị̄?” (“What do I need it for?”) The result is that today, generations of Igbo children are growing up - or have grown up - in many parts of the world unable to speak a word of Igbo. And as if that was not bad enough, even children growing up in the heart of Igbo land and raised by “educated” Igbo parents now speak English as their first language. As we have seen, it is not a secret that the educated Igbo man has a special fascination for the English language. It has become our status symbol and our measure of the next man’s level of education and intelligence. As adults, we communicate with one another in English, even in the most mundane conversations, no doubt to impress it upon our listeners that we too have been to school. If we could not do it in proper English, we do it in broken English. In fact, it seems that anything would do as long as it is not Igbo! For some, the mentality goes well beyond a mere fascination for English words. It is possibly only an Igbo man that would passionately argue that to give an Igbo child an Igbo name in this day and age is to permanently cripple the child’s life potentials in the wider world. What is so frightening is that we actually take ourselves seriously holding such views. That is why an adult would go out of his way to mutilate his ancestral family name to a point where it is no longer recognisable as an Igbo name. Or why another would drop the family name altogether and go for something rather fanciful. All of which would go to support the view by Paul Lewis that when people begin to think of their language as useless, they think of their own identity as useless too.6 It is also not a secret that the Igbo man is so adventurous and so widely travelled, and has made a home even in the most inhospitable corners of the earth. As a result, he is at home with virtually every language of the world. Well, except his own. But, come to think of it, the Igbo man is hardly the only bird in the world to have ever left its nest, nor the first to have come in contact with the outside world or learned the use of a foreign tongue. Asian birds of all plumes do it all the time. So do our Yoruba neighbours closer to home. In fact, the latter could possibly claim to have embraced the wider world for much longer than we have. Yet, neither they nor the various Asian nationalities would allow any exposures to other cultures interfere with their own sense of who they are. Which is why they never lose their tongues wherever they go. Which in turn explains why they tend to command such a collective vocal presence wherever you find them, often to the irritation of many. Even the few conscientious Igbo who still make an effort now and again to speak Igbo find they can no longer communicate without unconsciously sliding back into English. This is because the essential Igbo vocabularies no longer come naturally to us at any but the most superficial and rudimentary level. Gone are the deep idioms and proverbs once credited as the very palm oil with which our words were eaten; the expressions through which we found acceptable explanations for various human frailties; the expressions that gave us an alternative handle to life’s harsh realities, and the expressions by which our forebears measured their own wells of wisdom and intelligence. For was it not said that when a man is given a proverb and he has to have it interpreted for him, then it becomes obvious that the bridal price that was paid to marry his mother was a total waste, “Ónyé á tụ̀ụ̀rụ̀ ílú, kọ́wáárá yā nyā, màrá nà àkụ̀ é jìrì lụ́ọ́ ńnē yā fùrù èfù”. Even remembering the names of the most ordinary things in our world is now a huge struggle. As a simple example: butterfly is probably the most beautiful and most recognisable insect in the world. Yet, ask any ten Igbo men or women outside the shores of Igbo land what they called butterfly in Igbo and you are sure to find that about 80% of them would have forgotten within one year of leaving home. Which, perhaps, is why you would find butterfly listed on the internet and in an Igbo-English Dictionary as “ihe na-efe efe” (something that flies), as though we never had any proper names for the creature in our different villages. The truth is, we are all guilty of this gross amnesia and it is set to get a lot worse unless we can all come to our senses and contemplate the inevitable doom and take steps now to avert it. What are we saying here? If those of us who swam the rivers and drank from the springs of the ancestral hills could be struck by such drastic amnesia, what hopes are there for our children who are already handicapped by the lack of exposure to the language in our various homes? Or, for that matter, their children and children’s children? And therein lies the tragedy. But I am not under any illusions here, as I am well aware that this kind of sentiment probably means not a great deal to a lot of people. I once overheard someone rationalise, in some casual conversation in London, that the reason he did not regret his children’s inability to speak Igbo was because he reckoned that by the time they would need to go “home”, there would be nobody left in his homestead who did not speak at least a smattering of English! There are perhaps two tacit inferences that one can draw from this kind of rationalisation. One is that our friend has already resigned himself to what he considered the inevitable fate of the Igbo language once the few remaining folks who did not speak any English have passed away: it would either die with them, or cease to be of any practical use to the living. The other is that for as long as English was there to take its place, then communication could carry on regardless, and we would not have missed a thing! Of course, we do not seek to imply here that every single educated Igbo man and woman out there has failed in their duties to instil the ways of the fathers in their offspring. Nor is it intended to suggest that every Igbo child out there is a complete and utter lost case. There are of course lots of children who are as fluent in Igbo as they are in English and other languages and are capable of perfect code-switching as occasions demand. I think therefore that it is important to give credit to whom it is due. For that reason, I duff my hat to any parents and guardians out there who will never have or feel a need to communicate with their children in a foreign language, at home or out of it. Among such people are my very good friends, Matthew and Chinyere Ụkanwa whose five children in London spoke Igbo as soon as they could talk, such that by the age of three they had all attained as much fluency and proficiency in Igbo as any child growning up in their native village, Okporo Ọlụ. Matthew and Chinyere were able to achieve this enviable feat because they had the wisdom and foresight to seek out the proverbial black goat when it was still daytime. But the point is that people like Chinyere and Matthew are now very few and far between. I guess that those of us who could not provide a similar enabling environment to our own children have got our different excuses. Perhaps we were so overwhelmed by the pressures of our individual pursuits or the demands of our immediate circumstances that we just could never find the time or energy. Or perhaps we did make an effort but it just was never enough to stimulate or sustain any level of fluency in the children. Or we just found it more convenient to speak to them in the dominant language of our immediate environment. Or worse still, we made a conscious decision never to speak Igbo to them, either because we believed it would interfere with their acquisition of our chosen language, or because we felt that Igbo did not promise as much prestige and practical prospects in the wider world as, say, the English language. To those who had the desire but could not help the situation, I would say these simple words: there is still a chance for some redemption as it is never too late to begin to make amends. And the way to start is by actually speaking the language to our children at home. It may be hard-going, especially if the children are already past a certain stage in their early cognitive developments. If it helps, get them enrolled in a Saturday School for at least a couple of hours so they get to interact with other children in the language, and then reinforce the effort with more interaction at home. It is perhaps common knowledge that language provides a vehicle for communication. What may not be so obvious is that, in a cyclical fashion, language in turn feeds on communication for its own survival. That means that a language will cease to exist once communication ceases to operate in that language. On an individual level, that is what could happen to a child who is taken into a new linguistic environment before the age of five with no sustained effort to maintain the original language. It would then be only a matter of time before the old data is permanently replaced by a new. On a wider scale, this could involve an entire population losing its language due to a superimposition of another language by a dominant social group. Ask the former native speakers of Ajawa, Kpati, Kubi, Auyokawa and Teshenawa languages...7 which starved to death because everyone took to speaking Hausa, the dominant “colonial” language of the North of Nigeria. This book is intended as an essential companion for anyone with a genuine desire and interest in learning the Igbo Language. It is especially hoped that the generations of Igbo children growing up in the Diaspora will find this a useful stepping stone, with a careful guidance from committed parents and guardians, towards a reconnection and re-engagement with their heritage language. It is also hoped that this will serve a useful reference material for anyone teaching the Igbo Language in any formal education setting. It is not a collection of ready-made pass-phrases designed to open every imaginary door. It is rather an attempt at a portrayal of the Igbo world in its most basic form and an explanation of the way the Igbo language works, with some useful examples that I hope will encourage the reader to formulate their own phrases to communicate different realities. I believe that the key to learning a new language is having a vocal role model, whether it comes in the form of a person or in the form of an audio material. It is envisaged that there will be an audio-visual companion to this text as time goes on. But until that happens, it is recommended that anyone totally unfamiliar with the language should seek the guidance of a native speaker. If you are an Igbo child reading this book, it is hoped that, at least, one of your parents or guardians will already be familiar with the examples used, even if, like many, they have difficulties reading and writing Igbo texts themselves. If that is the case, a good way round the problem may be a reverse translation of the English equivalents. But who knows, that may even encourage them to have a go; afterall, it is never too late to learn. I genuinely believe that we will all need it if the Igbo language is to survive into the next centuries and beyond. The translations have been carefully chosen to ensure that the meanings are as close as they can get. The underlying interpretation of a concept is always more important than the surface transliteration of individual words and phrases, for not only is Igbo structurally different from English, it also shares a different thought pattern. Igbo is a highly tonal language, as it relies on Tones to distinguish between otherwise identical words and phrases. There is a high chance that, at the first attempt, a lot of the expressions will be given the wrong tones and the wrong pronunciations, and hence the wrong meanings. This is to be expected of anyone unfamiliar with the language. It is for this reason that I have tone marked all the examples used, in the hope that this will provide a useful guide to the complete beginner. I recognise that some experts may prefer to leave all High tones unmarked, and may also mark only the first in a line of successive Downsteps, whatever their pitch differences. However, as this is intended to guide the uninitiated, I consider it more helpful to apply tone marks on every possible syllable. The only exception is where the standard tone marks are not enough to account for all the different pitch changes as words mix and mingle in phrases and sentences. This is especially so when we have a succession of Downsteps where some are of a different pitch level than others, and it would be misleading to tone-mark them as though they were the same, more like speaking Igbo with a foreign accent. As an example, the phrase “ụmụ anyị” (our children) is tone marked as “ụ́mụ̄ anyị”, not “ụ́mụ̄ ānyị̄”, because the Downsteps on anyị are lower than that on the syllable immediately preceding them. Consider another example. In the phrase “Ágāālā m” (I have already gone), the pitch on the m (certainly a Downstep) is a step lower than the three preceding Downsteps. Contrast this with the phrase “Ágwālā m̄” (Don’t tell me), where all the three Downsteps, including the m̄ are of the same pitch level. With these observations in mind, it means that wherever we have left a syllable unmarked, it is because we believe it would be misleading to use any of the standard tone marks in those contexts. Otherwise, we have tone marked every possible syllable in the hope that this would aid pronunciation. Applying tone marks to all possible syllables in this way accounts for not just the lexical but also the structural use of tones in Ìgbò. It would be counter productive if we selectively applied some tone marks and expected the learner - who may be an absolute beginner - to work out the rest for him/herself. For this reason, I share the views of Íkóńnē, Ọ̀hàíkē and Yusuf1 on the subject. For more details on Ìgbò Tones, see Part II, Chapter 5. In general, the variety of Igbo presented in this book is the Standard model which has been universally adopted because of dialectal differences. However, where necessary, I have cited examples from different dialects in the spirit of celebrating the vast richness of the language. Sometimes the difference between dialectal variants may be just a simple case of consonant/vowel shifts, e.g. name: áhà, [áfà], [ávà], [ẹ́hà]; thing: íhé, [ífé], [ívé], [íyé], they: há [fá], [wá], [wé], [nwó]; body: àhụ́, [àrụ́], [ụ́hụ́], [ẹ̀shị́]; face: íhú, [írú], [íhwú]; market: áhị́á, [áfị́á], [ávị́á], [áshị́á], [áshwá]; etc. Sometimes there may be completely different words for specific concepts, e.g. leg: ụ́kwụ́, [ọ́kpà]; bottom: íkè, [òtùlà], [òtùlè], [ọ́hụ́]; clothes: ákwà, ùwé, [ḿwéyí], [àfè], [èfè], [ǹjà], [úkpò]; peanut: àhụ́ékérē, [àpàpá], [ọ̀kpàm̀pá]; maggot: [ìkpúrì], [ìkpúrù], [àgụ́], [ǹdù], [ḿpú], etc. Other times, the words may be the same but the tonal renditions may vary across dialects, e.g. night: ányàsị̀; ànyásị̀; ànyàsị̀; ànyáàsụ̀. Some forms no doubt have gained greater currency over time and are therefore more popular than others. But each one is just as valid. Tonal variations are irrelevant as long as they do not constitute any differences in meanings across dialects. For differences involving consonant/vowel shifts or totally different words, I have put the dialectal variants in square brackets, as above, for clarity. It is by celebrating varieties in this way that languages generate synonyms and enrich their vocabularies, reducing the need for loan words. In non-formal situations, there is no such thing as the right or wrong dialect. Every dialect is a different but legitimate variation of its parent language and therefore must never be suppressed. It is only fair in today’s world that no language form, whatever its historical advantages, should have the right or the ability to eclipse another. Nor should anyone feel that they have to apologise for speaking the way they do. Nor for that matter, should the dialectal differences become an impediment to communication, or an excuse for us to think of any borrowed medium as a way out. The book is divided into two parts. The first part is a showcase of some very basic concepts, ranging from the Igbo alphabet and the counting system to Igbo greetings; Rhymes and folk songs; Riddles; Prayers; the clock and parts of the body. Some of the rhymes may be untranslatable and may even sound silly and meaningless. However, you may find them a useful distraction from the monotony of the text, and any child unfamiliar with them will no doubt enjoy the novelty. It is hoped that many parents will find in them some fond reminders of their own childhoods, from those nearly forgotten moonlight games, and can take their children down those memory lanes. Ezike Bon Ugwu was educated at St James’ Catholic Primary School, Aku; Boys’ Secondary School, Aku and the University of Nigeria, Nsukka. His journey with the Igbo Language began with a brief stint in 1982 as a Guest News Translator and Broadcaster at the Anambra Broadcasting Corporation (ABC1), Enugu. In 1988, along with fellow alumni, Ikechukwu Nnaji and Chinyere Ọfụrụm, he pioneered the teaching of the Igbo Language at the Ondo State College of Education, Ikere-Ekiti. He was a co-contributor to the book: IGBO - Nigerian Certificate in Education Series, published for the Ondo State College of Education in 1990. He currently lives in London with his wife and three daughters and works with a Local Government. This is yet another text for teaching Igbo to beginners and learners who may or may not be native speakers or those in the Diaspora for whom Igbo is a heritage language. The text is in two parts: basic concepts and essentials of Igbo grammar. Each of the parts complements the other. The basic concept is fully, visually and copiously illustrated. Apt and appropriate examples are also provided. The essentials of Igbo grammar are interesting and have added value to the work. I believe and hope that this book will be very useful to its many users and readers. The book presents to the outside world the natural Igbo environment, plus the diversity, richness and the productivity of the Igbo language. Bon Ugwu took Igboland on a cruise. His illustrations with real images are attractive and his preference of dialectal Igbo words to ones borrowed from other languages is didactic. His use of the grammar-translation method is very impressive. Readers will no doubt learn Igbo with this book, but they will also learn better English from his translations. I strongly recommend this book to all Igbo families not only in the diaspora but also here at home. I also recommend it to peoples of other races and ethnic groups who may wish to learn Igbo. 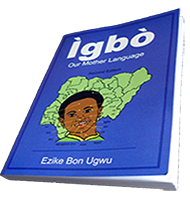 Igbo - Our Mother Language by Ezike Bon Ugwu is an excellent book. It is very comprehensive, well-written and fully illustrated. 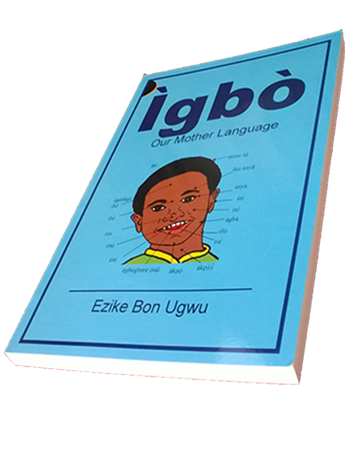 It offers greater understanding of Igbo grammatical systems, and provides the reader the tools to better appreciate and enjoy Igbo language. Armed with these tools, reading such Igbo books as Uwadiegwu by N. B. Obodo and Mmiri Oku E Ji Egbu Mbe by Tony Ubesie becomes easy and enjoyable. Thanks to Bon Ugwu, Prof Nolue Emenanjo, Chidozie Ogbalu and many others for keeping the Igbo language alive today. I've always wanted to learn Igbo, the language that my parents speak, but struggled to find good resources even with the internet. Then I came across this book which is everything I needed and more! It starts from the basics to provide a solid foundation. The examples are clear and easy to understand. The practical layout with the book organized into topics alongside colour illustrations are also very useful. Just from a few sessions going over things by myself, I feel that I have made a genuine start in cultivating the language. It's perfect for beginners but I'd definitely recommend it to everyone regardless of their ability. This book is a must have if you want to learn the Igbo language. It is so well laid out so it makes the learning path well structured and easy to follow. The colourful pictures also aid the learner in getting a better feel of the Igbo culture which is always important when learning a new language. I would definitely recommend this book if you like an easy to use but effective language learning tool. This book really gets me motivated and excited to learn Igbo! Email This Page To A Friend - easy.